This was a nice change in TTM pace with this success from Xavier Hernandez. I definitely don't mind getting 1987s in, but I got some cool 1990s cards in with this success. 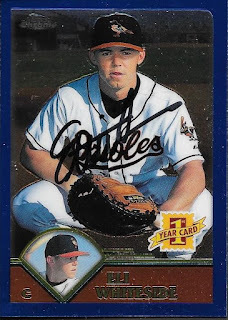 The above 1995 Fleer was a really cool card to get signed. Again, like I have said so many times, this is such a freaky set. It's like the printing machine went nuts and Fleer just stuck with whatever came out. I love the card, though, and it was an easy pick to send along. As nuts as 1995 Fleer is, 1996 Fleer is basic and straightforward. The matte finish lends to a nice auto, so I had to send this one along as well. In the end, I sent two Fleer, two Donruss and two Topps to get signed. They all look great, I think. I'm glad I tossed the 1991 Donruss in, as I had a ton of them when I was growing up, and not enough represented in my album. Hernandez (b. 1965) played in the majors from 1989 to 1998 for the Blue Jays, Astros, Yankees, Reds and Rangers. He had a career record of 40-35, 562 strike outs and an ERA of 3.90. I mailed to Hernandez on September 28 and got the cards back on October 23, for a 25-day TAT. Here is another TTM success from a player who charged fees that I finally got around to mailing to recently. 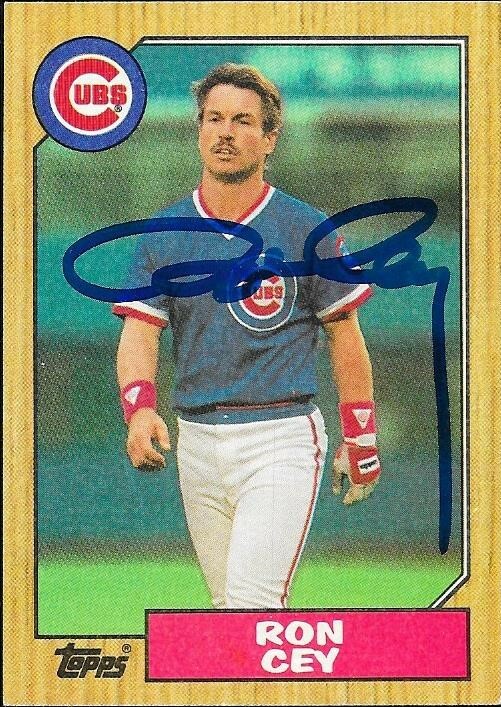 This one was nice, because I added yet another 1987 Topps to my autograph collection. 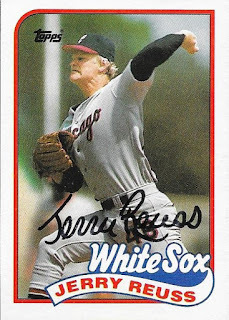 I love this card because Jerry Reuss looks like Gary Busey in this card. I think so, at least. 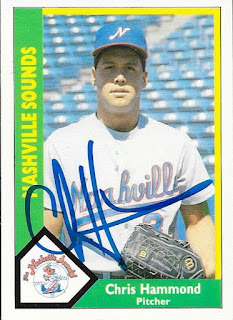 I also liked this 1989 Topps because I remember this card from my very early days of collecting. 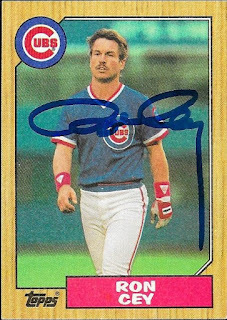 I will always have a special place in my heart for 1989 Topps, and would have pursued that set of signed cards, but my huge lot of 1987 Topps trumped that. Reuss (b. 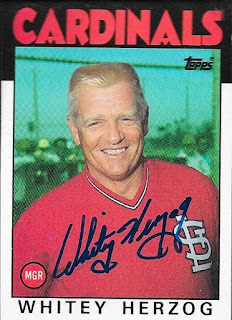 1949) played in the majors from 1969 to 1990 for the Cardinals, Astros, Pirates, Dodgers, Reds, Angels, White Sox and Brewers. He had a career record of 220-191 with 1,907 strike outs and a 3.64 ERA. He was an All Star in 1975 and 1980. 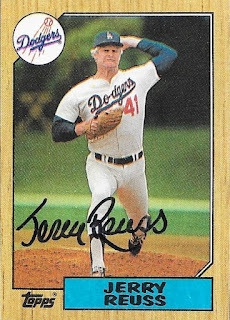 His best finish in the Cy Young Award voting was 2nd in 1980, the same season he had his best finish for MVP voting (20th), while with the Dodgers. He won the World Series in 1981 as a Dodger. Reuss appeared on the 1996 Hall of Fame ballot, but only received 0.4% of the vote. I mailed to Reuss on Octiber 16 and got the cards back on October 23, for a 7-day TAT. I paid his fee of $13/card. 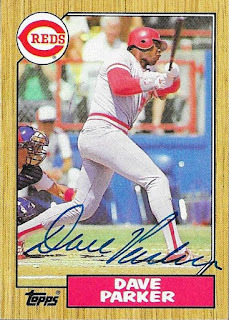 I had gotten Dave Parker TTM way back in 2010 or 2011 on a ball. Recently, I decided I would try to get as many 1987 Topps as I could, so I figured I would send these two cards off and try him again. Since Parker has Parkinson's Disease, I wanted to get these out while he was still signing. Rumor has it, he won't be signing for much longer. Parker (b. 1951) played in the majors from 1973 to 1991 for the Pirates, Reds, A's, Brewers, Angels and Blue Jays. He had 2,712 hits, 339 home runs and a .290 batting average. The 1978 NL MVP was also a 2-time batting champ (1977 and 1978). He finished in the top 10 in the MVP voting 6 times and was an All Star 7 times (1977, 1979, 1980, 1981, 1985, 1986 and 1990). Parker was also a Gold Glove Award winner in 1977, 1978 and 1979 and a Silver Slugger Award winner in 1985, 1986 and 1990. Parker won the World Series with the Pirates in 1979 and the A's in 1989. 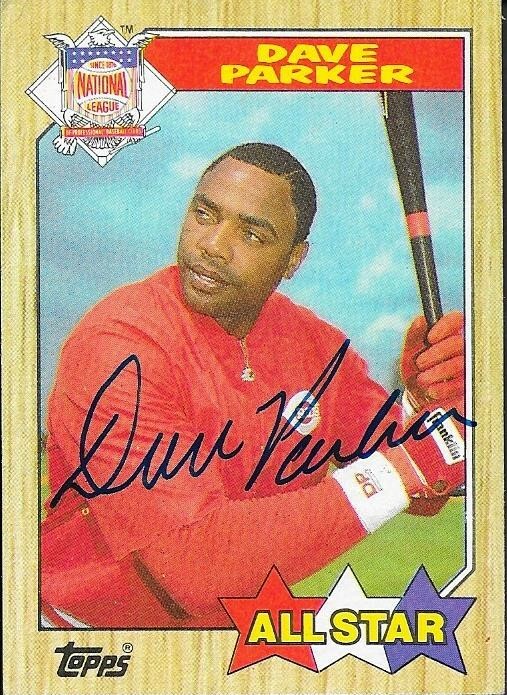 For some crazy reason, Dave Parker is not in the Hall of Fame. Jim Rice is in with similar awards and similar stats. Parker lasted 15 years on the ballot, the then maximum that anyone could remain on the ballot. He only received at most 24.5% of the vote. His last chance was in 2011, and he only received 15.3% of the vote that year, well short of the required 75%. Now, Parker's only chance at the Hall is via the Veterans committee. He will be eligible this December for the Veterans Committee vote, but with other popular players such as Alan Trammell, Jack Morris and Lou Whitaker on that ballot, it doesn't look like Parker will make it this time, either. I mailed to Parker on October 26 and got the cards back on October 23 for a 7-day TAT. I paid his fee of $20/card. 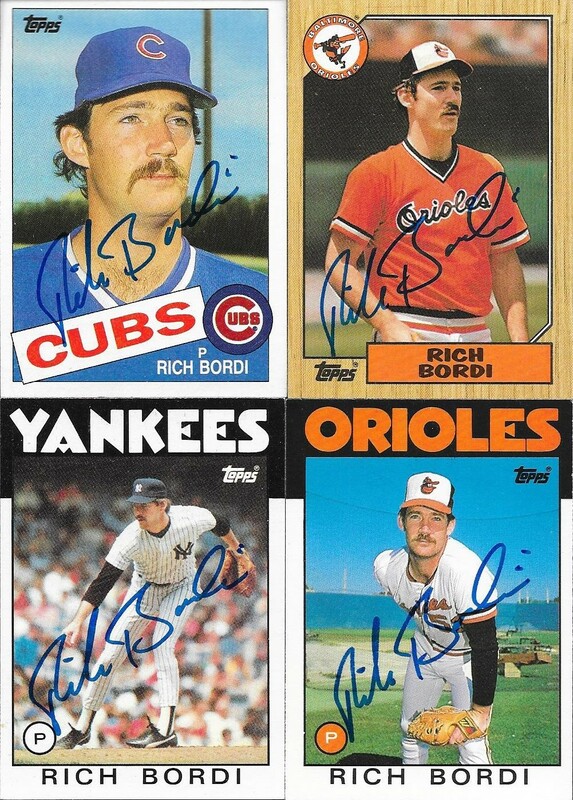 This was a really nice TTM success, and one where I really couldn't decide on which cards to send. I wanted to make sure I sent this 1986 Topps Traded, because one of the things I tend to look for in a card to send is hairstyles of the times. That and awesome poses, or amazing uniforms. 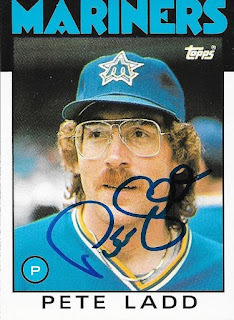 Since Pete Ladd looked a lot like Weird Al in this shot, I had to send this one off. Conrad from the Columbia antique shop gave me a partial set of 1980 Topps, so I have been reluctant to drop any of those cards off of the requests. I'm not the biggest fan of having players sign cards with other folks on them; mainly because I don't want to lose one that has already been signed, and I don't want OCD to take over when there is only one signature on the card. Still, I wanted one of Conrad's cards to go on the journey. Again, here is a cool hairstyle and uniform on this 1984 Fleer. I also wanted to make sure I used one of the cards from my FLeer box, especially since I don't have a whole lot of mid-80s Fleer anyway. I also added some Topps cards, as usual. I had to add a 1987, of course. 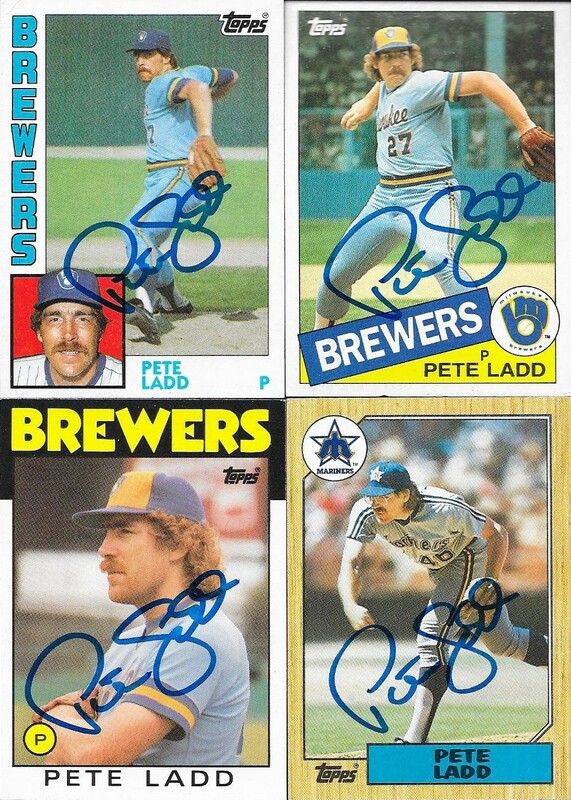 I also liked the 84, 85 and 86 that I sent along. I almost dropped the 86, since I sent the Topps Traded, but I wanted them both, side by side, in my album. Luckily, Ladd signed everything. Ladd (b. 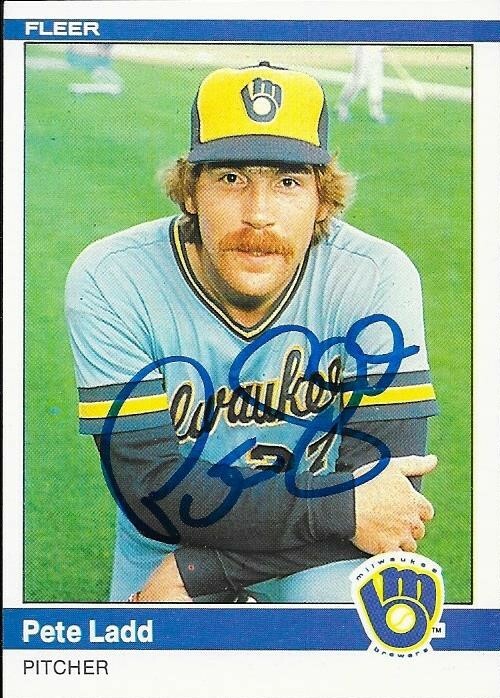 1956) played in the majors in 1979 and from 1982 to 1986 for the Astros, Brewers and Mariners. He had a career record of 17-23 with an ERA of 4.14 and 209 strike outs. 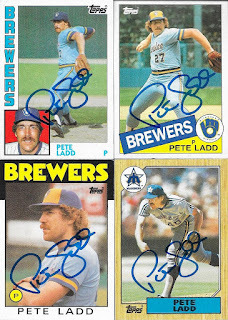 I mailed to Ladd on October 9 and got the cards back on October 21, for a 12-day TAT. Here are some more 80s cards in this TTM success from Manny Trillo. 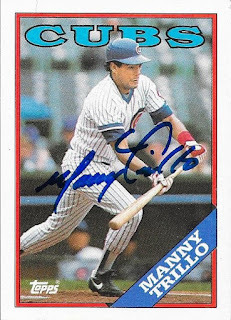 Trillo has a great signature and it really shows up well on the above 1988 Topps. 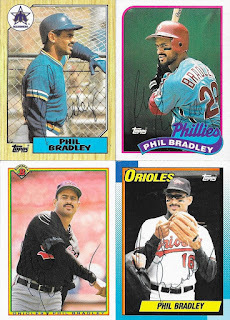 I knocked out two cards from 1986 (base and traded), a 1987 and 1985. They all look great with Trillo's signature on them. Trillo (b. 1950) played in the majors from 1973 to 1989 for the A's, Cubs, Phillies, Indians, Expos, Giants and Reds. He had 1,562 hits, 61 home runs and a .263 batting average. He was an All Star 4 times (1977, 1981, 1982, 1983) and won the Gold Glove Award 3 times (1979, 1981 and 1982). 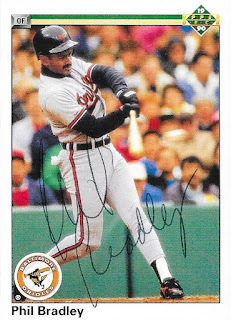 He also won the Silver Slugger Award in 1980 and 1981. Trillo was the 1980 NLCS MVP and helped the Phillies win the 1980 World Series. 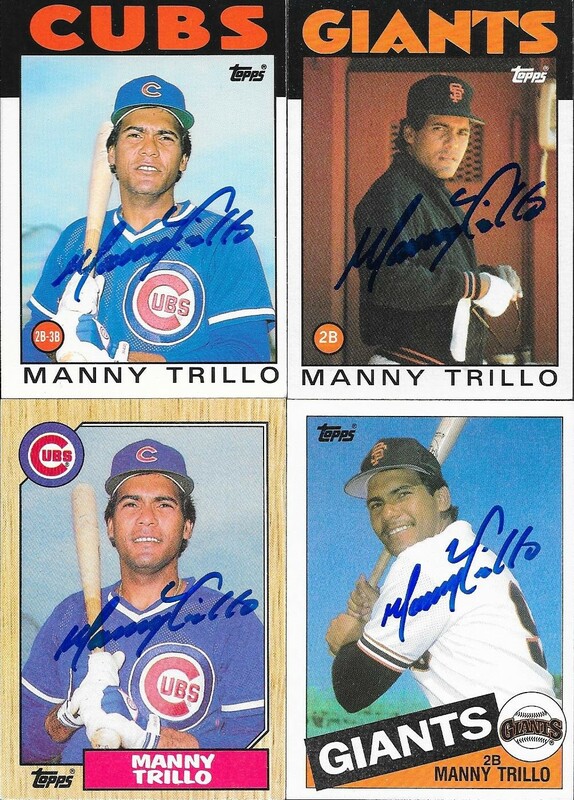 I mailed to Trillo on February 6 and got the cards back on October 20, for a 256-day TAT. This was a nice TTM success showing off some late 80s cards from Benny DiStefano. I was able to add a nice 1989 Topps Traded. The Topps Traded cards are a different material than base Topps cards. They really look nice when signed. I added a 1985 and 1987 Topps as well. Both of them are nice cards, with the 1987 being yet another addition to my album. DiStefano (b. 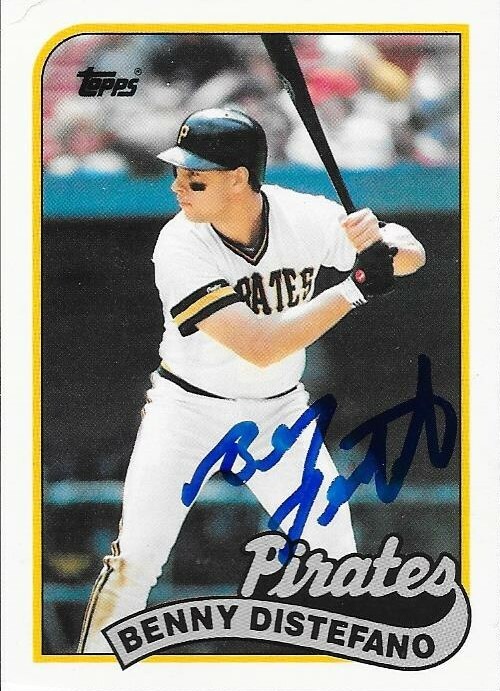 1962) played in the majors in 1984, 1986, 1988, 1989 and 1992 for the Pirates and Astros. He had 82 hits, 7 home runs and a .228 batting average. 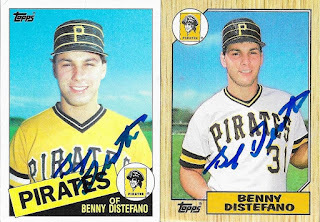 I mailed to DiStefano on October 4 and got the cards back on October 20, for a 16-day TAT. 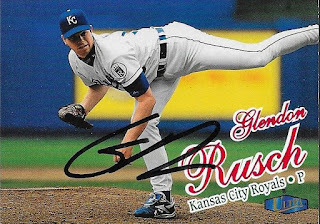 I have had a bunch of exciting TTM successes come in recently. 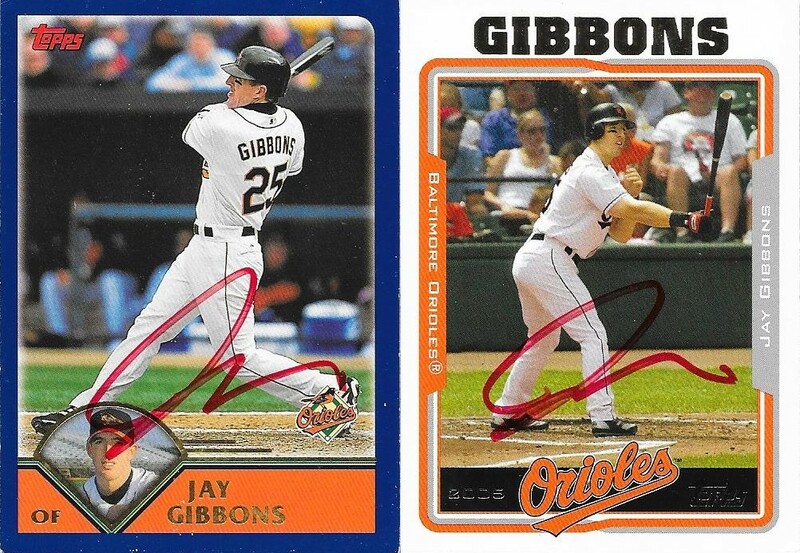 One that I may have been the most excited about is this return from former Oriole, Jay Gibbons. I had a multitude of Gibby's cards to choose from, and the above 2005 Studio was a card I wanted to get into my album for a long time. I'm glad Gibbons was the first out of that set that I was able to add. I love the background of the card, a shot of the Baltimore skyline as seen from the Inner Harbor. I had to add a few Topps cards to the album, so I chose these two, a 2003 and a 2005 Topps. The Oriole orange and blue border of the 2003 don't quite go together well, but still, 2003 is a pretty nice set. 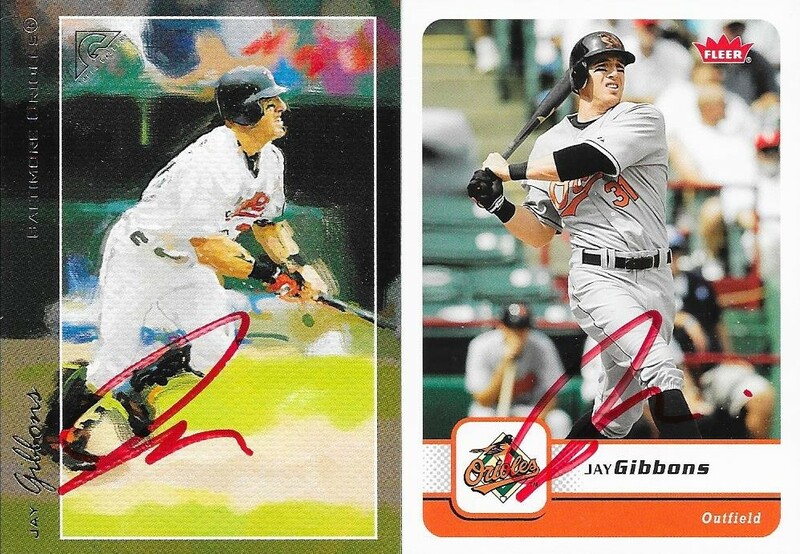 Finally, I decided to add two other different sets to the album in 2005 Gallery (left) and 2006 Fleer (right). Gibbons (b. 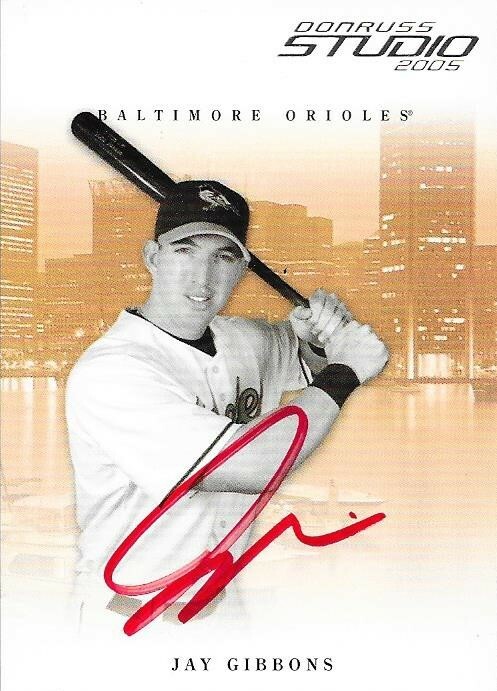 1977) played in the majors from 2001 to 2007 and 2011 to 2012 for the Orioles and Dodgers. He had 759 hits, 127 home runs and a .260 batting average. 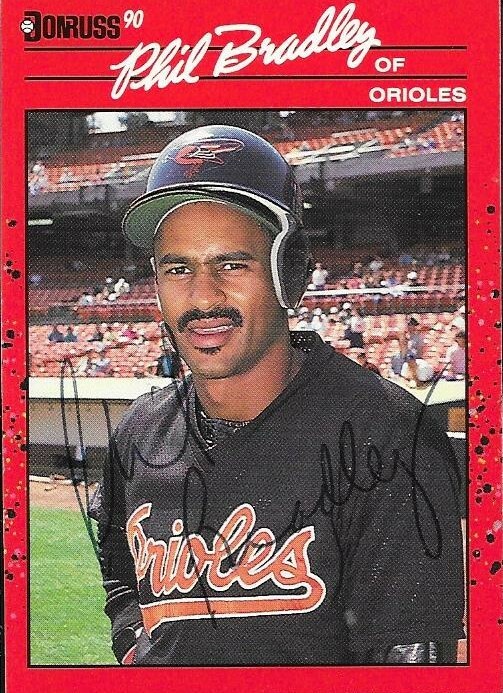 He was obtained by the Orioles when picked during the 2000 Rule V Draft. He was a member of the O's during the "dark ages" of the organization, when they were right in the middle of a 14-year losing streak. I remember him fondly. He was also shown on a TV in the movie, "Wedding Crashers" hitting a home run (when Owen Wilson's character is depressed and avoiding Vince Vaughn). Gibbons is now a coach in the Dodgers system. 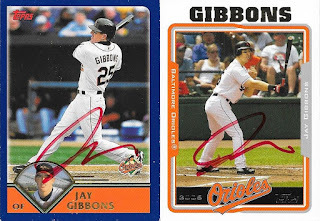 I mailed to Gibbons on May 10 via the Rancho Cucamonga Quakes and got the cards back on October 20, for a 163-day TAT. I was told all season that the Wood Ducks would not be making team card sets for the 2017 season. I got a surprise on Twitter the other day, though, when I happened to see that the Wood Ducks had finally gotten some created. I said all season long that they should, especially since this was their first season. What better way to cap it all off than to issue a set commemorating the championship season? I love the design, a take on the 1982 Topps design, but with a wood bordered background. I enjoyed thumbing through the set and seeing the familiar faces from this season. I'm sure that many of them won't be back, but I'll still find a way to get them signed. I bought 4 sets initially, one for me to work on getting signed next season, one to put in an album to keep a running series of Wood Ducks sets, and two so that Chris could do the same. I hope they come out with sets every year. I like the idea of keeping up with an album of each season. I may also expand it to include Wood Ducks featured in Minor League Heritage and Pro Debut. 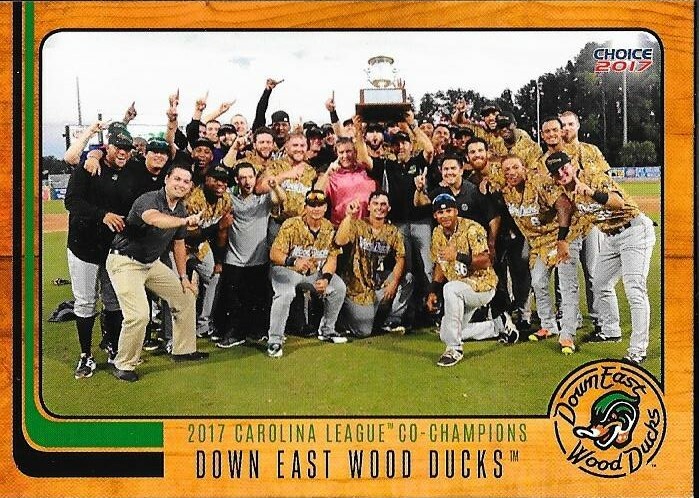 I only have two cards to add, then, with Yanio Perez showing up in Heritage, and the Wood Ducks mascot, Dewd, showing up on the disc inserts. Here are some more signed cards from the 1980s that I was able to add to my album with this TTM success from Jim Clancy. 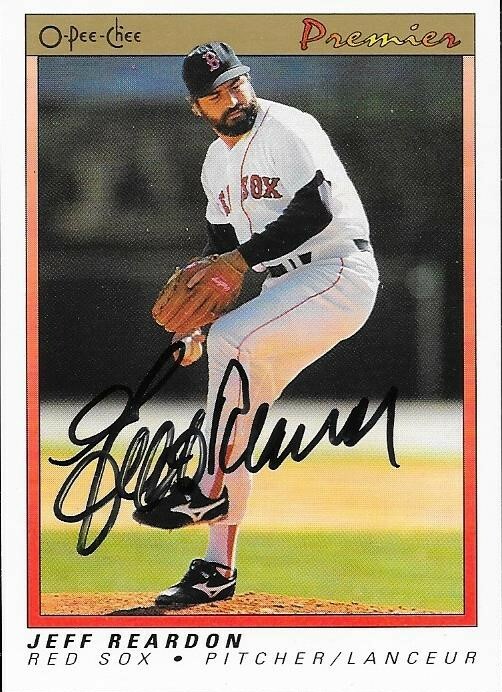 I especially liked this 1986 Fleer that I got signed. There is a whole lot of blue on this card, now that I am paying some more attention to it. Still, it looks nice. I added some nice Topps cards, including another 1987 Topps for the album. As of today, I am sitting on 99 signed cards from that set. Not too bad. The 1989 Topps Traded (bottom right) turned out really nice, as well. Clancy (b. 1955) played in the majors from 1977 to 1991 for the Blue Jays, Astros and Braves. He had a career record of 140-167 with 1,422 strike outs and an ERA of 4.23. 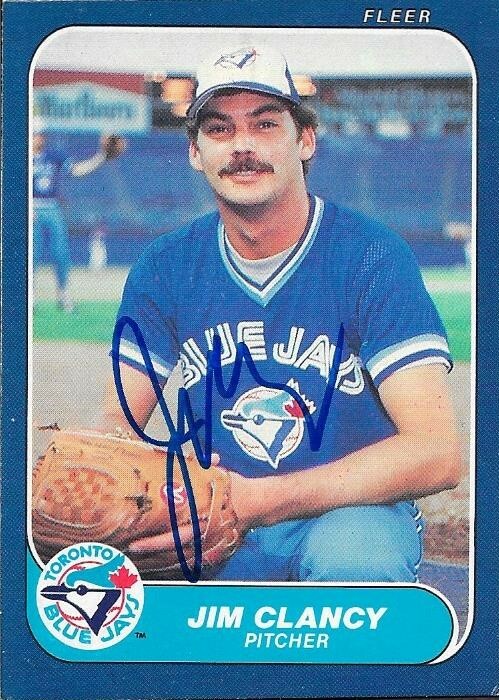 He was an All Star for the Blue Jays in 1982. 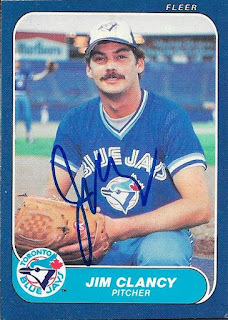 He was a member of the inaugural Blue Jays team of 1977. He pitched 3 games for the Braves in the 1991 World Series, picking up a win, but the Braves ultimately lost to the Twins. I mailed to Clancy on September 20 and got the cards back on October 17, for a 27-day TAT. 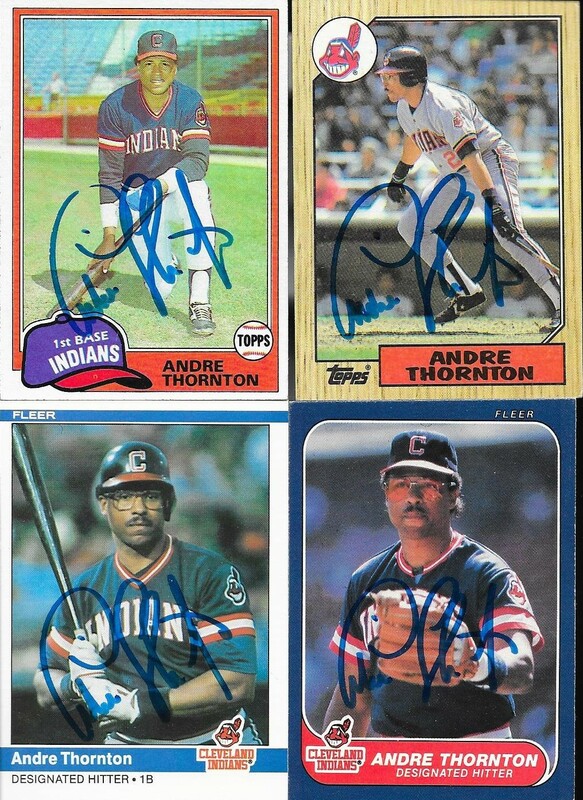 This was a nice TTM return from Andre Thornton on some cool 1980s cards. The above 1986 Topps Indians leaders card really turned out well. 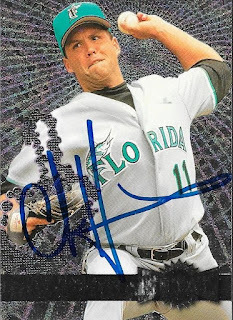 I like these cards, and they look really nice when signed. Thornton has a really interesting signature, and it really pops on this card. I also added a 1981 Topps, 1987 Topps, 1984 Fleer and 1986 Fleer. 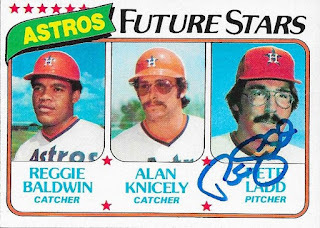 They all look good, but none of them matches the 1986 Indians leaders card. Thornton (b. 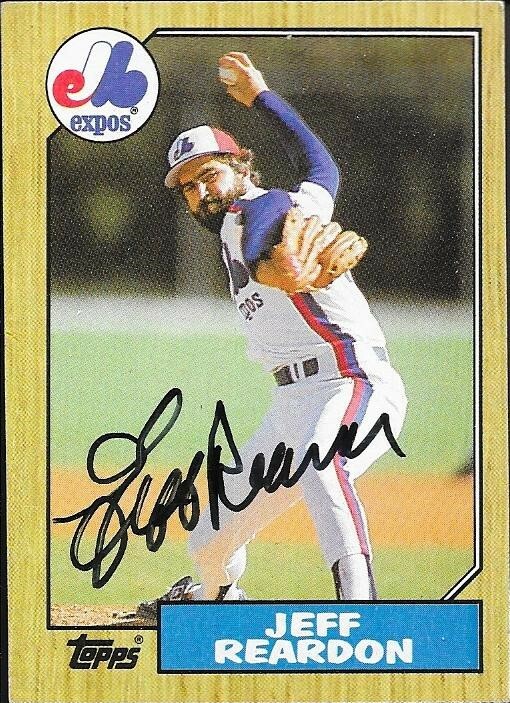 1949) played in the majors from 1973 to 1979 and 1981 to 1987 for the Cubs, Expos and Indians. He had 1,342 hits, 253 home runs and a .254 batting average. 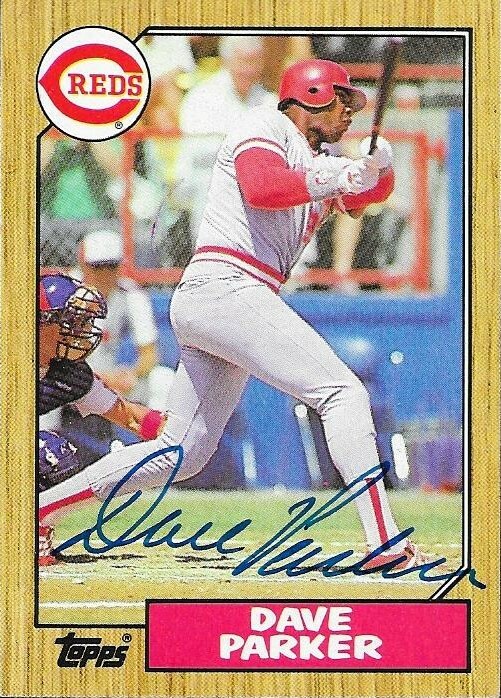 He was an All Star twice (1982 and 1984) and won the Silver Slugger Award in 1984. He received MVP votes three times in his career. His best finish was 19th following the 1984 season for the Indians. I mailed to Thornton on September 16 and got the cards back on October 16, for a 30-day TAT. 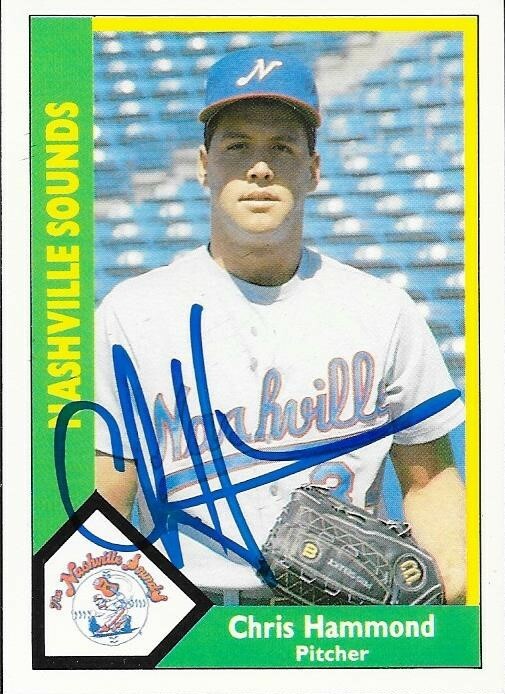 Here is another player who's cards I sat on for a long time before I finally mailed to him. 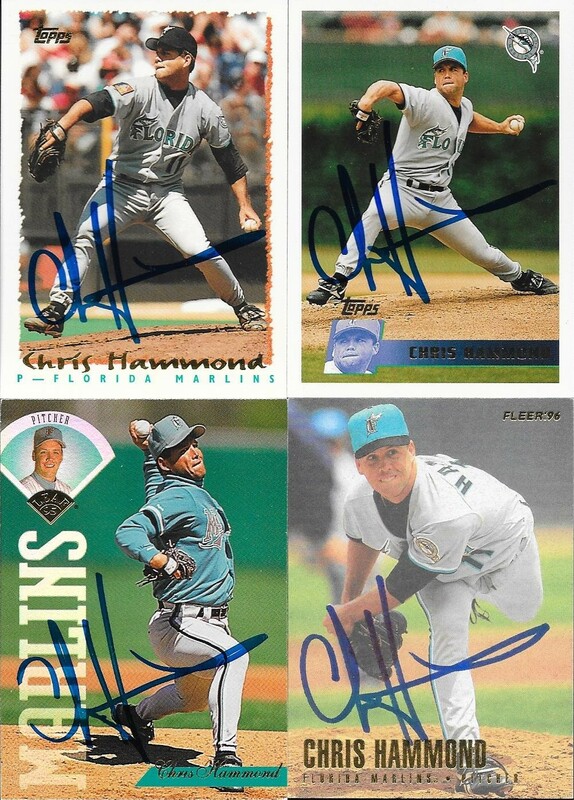 The reason why I waited so long to send these cards to Chris Hammond was because he charged for his autograph, and I didn't want to spend the money. In an effort to clean up my box, I went ahead and mailed to some of those guys who charged. I was really happy with the cards that I chose. The 1996 Fleer Metal shown above turned out really nicely. Hammond charges $1.00/card to a scholarship fund, so I had no problem sending him some money, once I got around to it. 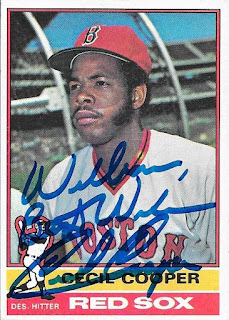 I was able to get another card signed out of the attic box that Mom sent me. These cards aren't anything glorious, but they do help when you need cards of someone who was in the minors at that time. 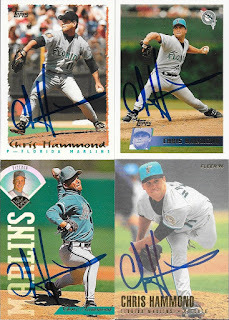 Finally, here are the other cards that I got back from Hammond. The highlight, of course, is the 1996 Topps at top right. 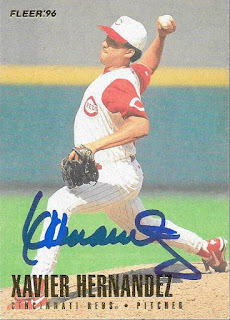 I have very few cards from this set, let alone of any guys who sign, so I definitely needed to make sure that one was in my TTM request to Hammond. Hammond (b. 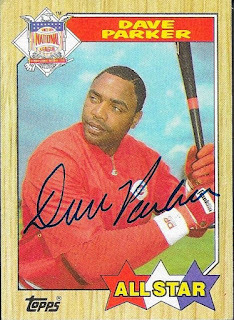 1966) played in the majors from 1990 to 1998 and 2002 to 2006 for the Reds, Marlins, Red Sox, Braves, Yankees, A's and Padres. He had a career record of 66-62 with an ERA of 4.14 and 712 strike outs. I mailed to Hammond on October 4 and got the cards back on October 16, for a 12-day TAT. This was a TTM success that added a few late 90s cards to the album that I mostly came across in some old boxes at my LCS. I like these 1998 Fleer Ultras. They lend themselves to great autos since they have no borders and are fairly glossy. This shot of Rusch was a good one, and it looks great signed. I picked up a box of 1996 Bowman while handing with Andrew, so I wanted to add a few of these to my album. I like the coloring on the border, almost a beige to pink color like 1968 Topps (without the burlap). The 1997 Stadium Club TSC 2000 is really cool, a type of card that I hadn't seen before. Rusch (b. 1974) played in the majors from 1997 to 2006 and 2008 to 2009 for the Royals, Mets, Brewers, Cubs, Padres and Rockies. 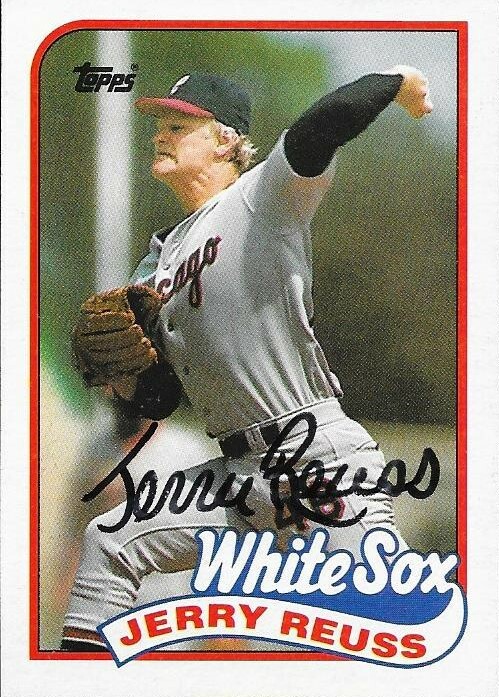 He had a career record of 67-99 with 1,088 strike outs and an ERA of 5.04. 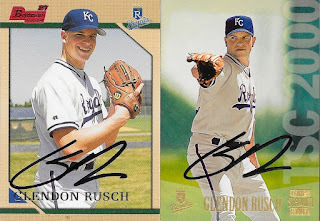 I mailed to Rusch on September 2 and got the cards back on October 16, for a 44-day TAT. I got a package in the mail a few days ago from my buddy, Michael. He had just sent me a package that had a bunch of IP autos that he picked up for me, but this time around, he sent me my birthday package. 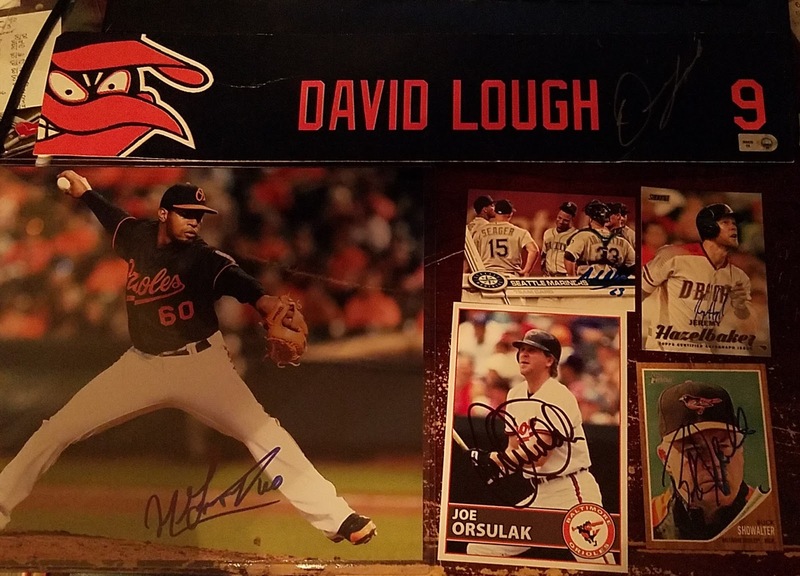 In it was a signed locker nameplate of David Lough, a signed 8x10 of Mychal Givens, a signed post card of Joe Orsulak, a coupld IP autos, and a Jeremy Hazelbaker auto from 2017 Stadium Club. The IP signed cards were Buck Showalter on a 2011 Heritage and a 2017 Topps Mariners team card signed by Andrew Albers. Thank you so much for the birthday package, Michael! I really appreciate it! I had gotten Cecil Cooper's autograph while at the National in Chicago two years ago. I got a ball signed by him, and Max took care of a 1987 Topps. 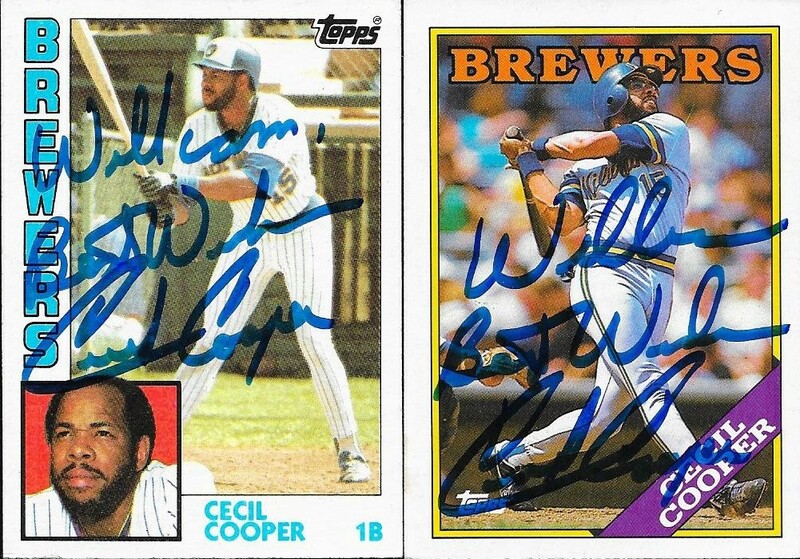 Still, I had a ton of Cooper's cards, so I figured I would drop a few in the mail, as well. This 1976 Topps turned out really nice. He personalized everything, which is fine by me. I also added a 1984 and 1988 Topps. Both of those are nice cards. If you want to read my bio that I wrote on him two years ago, the link is here. 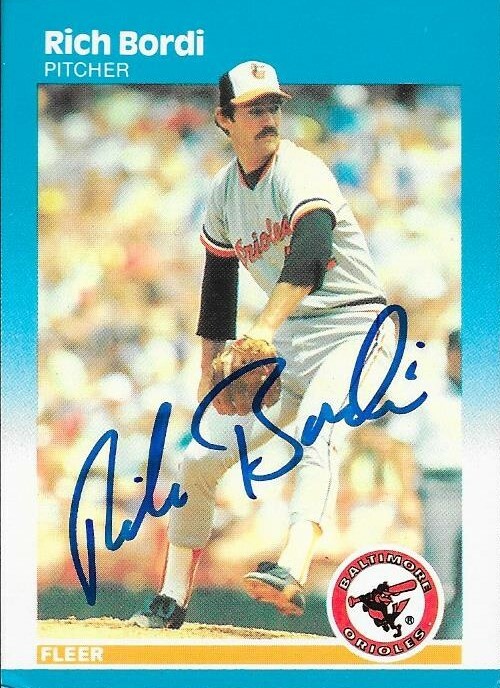 I added another former Oriole to my autograph collection with this TTM success from Phil Bradley. He had a bunch of cards to choose from, so I wanted to make sure that I had several Orioles cards represented. 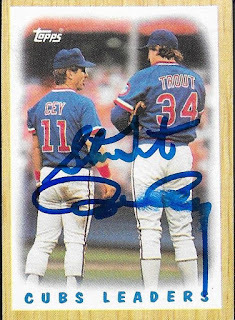 This 1990 Donruss turned out really nice, even though Bradley used a ballpoint pen. The signature really shows up in the scan. I was worried that it wouldn't show up. He had quite a few Topps cards to choose from, so I selected a 1987, of course, and also 1989 and 1990. 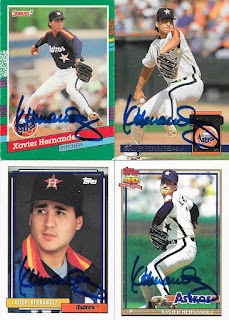 The 1990 Bowman (bottom left) also was a nice choice. One card manufacturer that seems to always be passed over for me is Upper Deck. Their early 90s stuff especially just doesn't pop for me. That being said, I wanted to send off this 1990 Upper Deck mainly because it came out of a team set of Orioles cards that I picked up way back in 1990. The clamshell hanger case that the set originally came in has long since deteriorated, so the cards just reside in my Orioles box. I wanted to make sure that one of them found it's way into my autograph album, and now one has! Bradley (b. 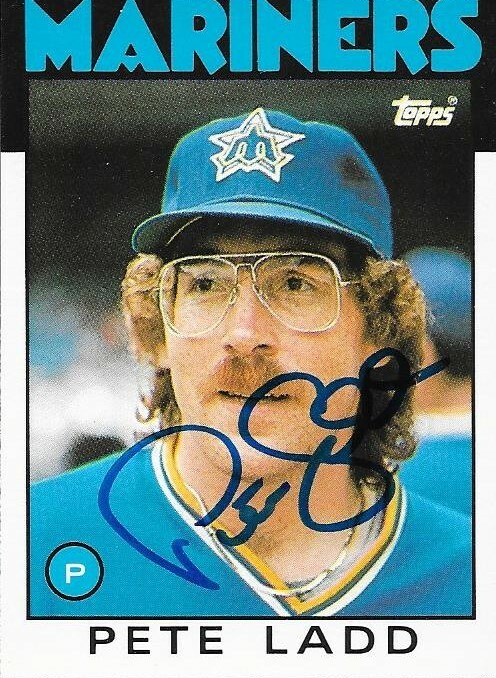 1959) played in the majors from 1983 to 1990 for the Mariners, Phillies, Orioles and White Sox. He had 1,058 hits, 78 home runs and a .286 batting average. He appeared in the AL MVP voting in 1985, when he finished 16th and made his only All Star appearance. He batted .300 or better in 3 seasons. I mailed to Bradley on September 26 and got the cards back on October 13, for a 17-day TAT. 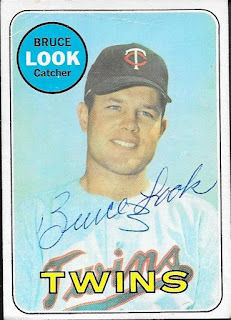 I am rarely able to add 1969 Topps cards to my album, mainly because I am still working on the set. I know I say every year that I will complete the set, but sadly, I am still plugging along with it. One of these days I will finish it, and will be able to move on to other sets, but who knows when that will be. 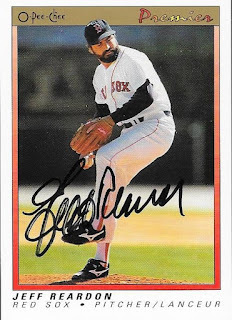 So, that being said, here is a TTM success I received from Bruce Look. I think this card was extra out of a batch of cards I had picked up for my set. This means that I had this on my list, but forgot to cross it off when I got one, making me have to re-purchase the card. I hate when I do that, but it was cool because it gave me a card to send out for TTM. Look (b. 1943) played for the Twins in 1968, his only season in the majors. He had 29 hits, no home runs and a .246 batting average. I mailed to Look on May 11 and got the card back on October 13, for a 155-day TAT. 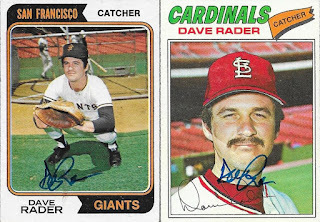 Here are some cards from the 1970s that turned out really nice, in this success from Dave Rader. The above 1976 Topps is a really cool card, with him showing off the bat. 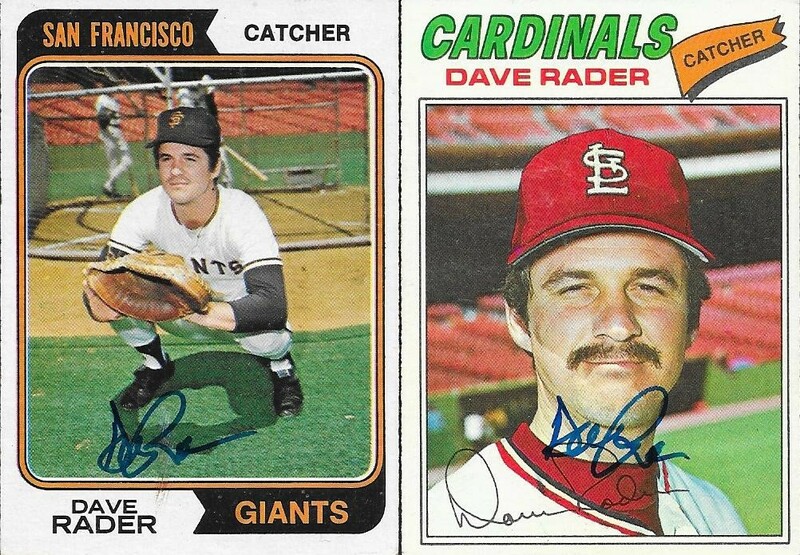 I liked the 1977 Topps on the right, since it is an obvious airbrush card. Some of those are historically bad, but this one it pretty decent. The 1974 Topps on the left turned out really nice, as well. Rader (b. 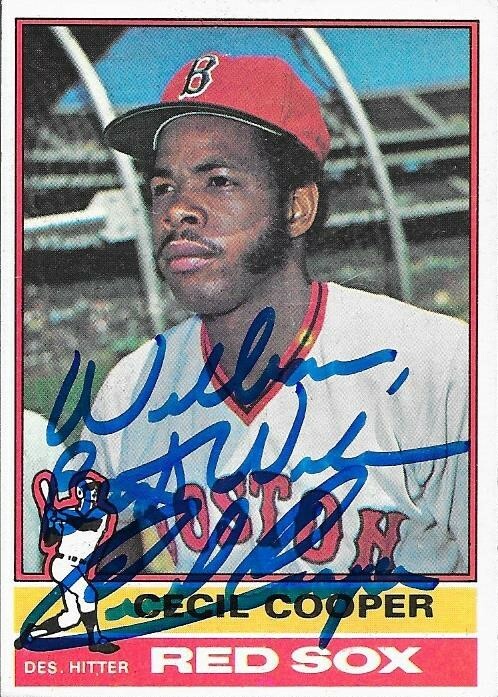 1948) played in the majors from 1971 to 1980 for the Giants, Cardinals, Cubs, Phillies and Red Sox. 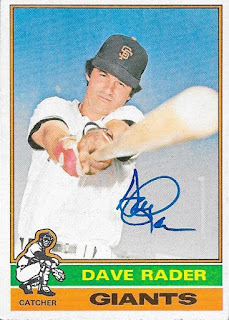 He was a first round pick (18th overall) by the Giants in the 1967 June amateur draft out of high school. He had 619 hits, 30 home runs and a .257 batting average. He finished second in the 1972 NL Rookie of the Year voting to Jon Matlack. He is not related to former player and manager, Doug Rader. I mailed to Rader on September 2 and got the cards back on October 10, for a 38-day TAT. 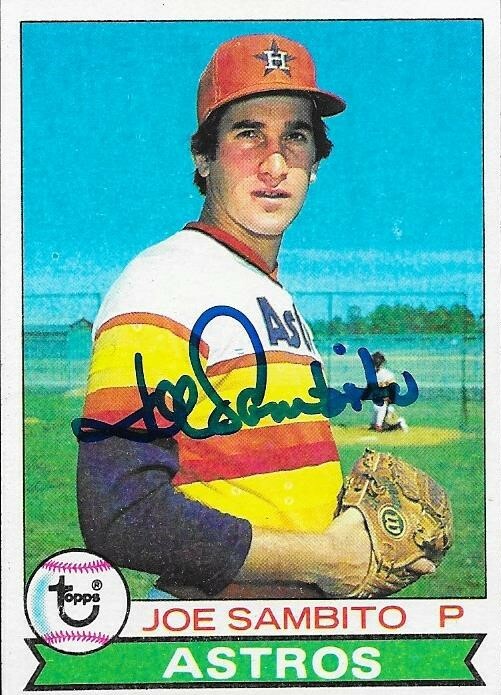 Here is a TTM success that shows off one of the most outrageous uniforms of all time, the 1970s Astros uniform. This 1979 Topps of Joe Sambito really shows off the colorful Astros jersey. You would think their hats would be equally as outrageous (something like the Pirates pillbox caps of that era come to mind), but their hats are pretty low key compared to the jerseys. 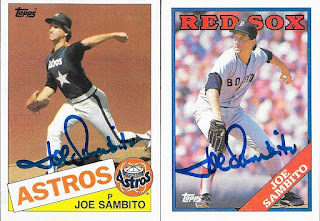 These later 80s cards show Sambito in less flashy uniforms. 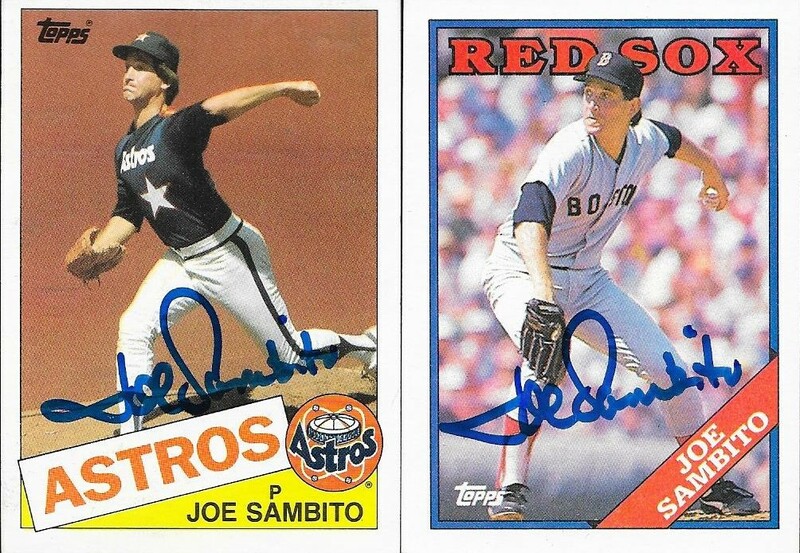 Still, they are nice cards, and Sambito has a really nice signature. Sambito (b. 1952) played in the majors from 1976 to 1982 and 1984 to 1987 for the Astros, Mets and Red Sox. He had a career record of 37-38 with an ERA of 3.03 and 489 strike outs. He was an All Star in 1979, the only season in which he received NL MVP votes (he finished 21st). He received votes for the Cy Young Award in 1980, where he finished 5th (NL). I mailed to Sambito on September 28 and got the cards back on October 6, for an 8-day TAT. I always enjoy obtaining an autograph of a former Oriole, no matter how obscure the player. I had a couple Eli Whiteside cards in my box, so I figured I would take a shot at sending to him via the Giants this season. Luckily, I got two of the three cards back that I sent, and they turned out really nicely. I love the above 2003 Topps Chrome. This is a really pretty set, and the card looks great in person. I had two of these 2012 Topps of Whiteside, so I went ahead and sent them both. He kept one of the cards, which is fine. Whiteside (b. 1979) played in the majors in 2005, 2009 to 2012 and 2014 for the Orioles, Giants and Cubs. He had 108 hits, 10 home runs and a .210 batting average. He was on the Giants teams that won the World Series in 2010 and 2012, but he did not appear in those post seasons. He is now the bullpen catcher for the Giants. I mailed to Whiteside via the Giants Spring Training on February 23 and got the cards back on October 5, for a 224-day TAT. I sat on my Ron Cey cards for a long time, mainly because I thought I had seen that he charged a fee. 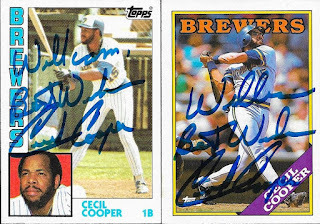 I looked again recently and saw that he would sign up to 2 cards for free, so I went ahead and sent off the two 1987 Topps cards that he is on. I was disappointed when this one came back smudged, since I had already gotten it signed in person by Steve Trout at the National. I'm going to keep it as is, though, and not try to replace it. Cey (b. 1948) played in the majors from 1971 to 1987 for the Dodgers, Cubs and A's. He had 1,868 hits, 316 home runs and a .261 batting average. He was an All Star six seasons in a row from 1974 to 1979 and finished as high as 8th for the NL MVP Award (1977). He won the World Series with the Dodgers in 1981. Cey appeared on the 1993 Hall of Fame ballot, but received only 1.9% of the vote. I mailed to Cey on September 25 and got the cards back on October 5, for a 10-day TAT. 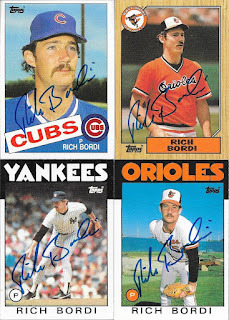 Here is another former Oriole that I was able to get TTM in Rich Bordi. 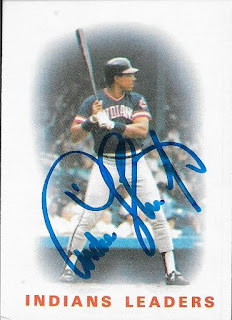 I like this 1987 Fleer that I got back, since it really matches with the blue Sharpie that Bordi signed with. 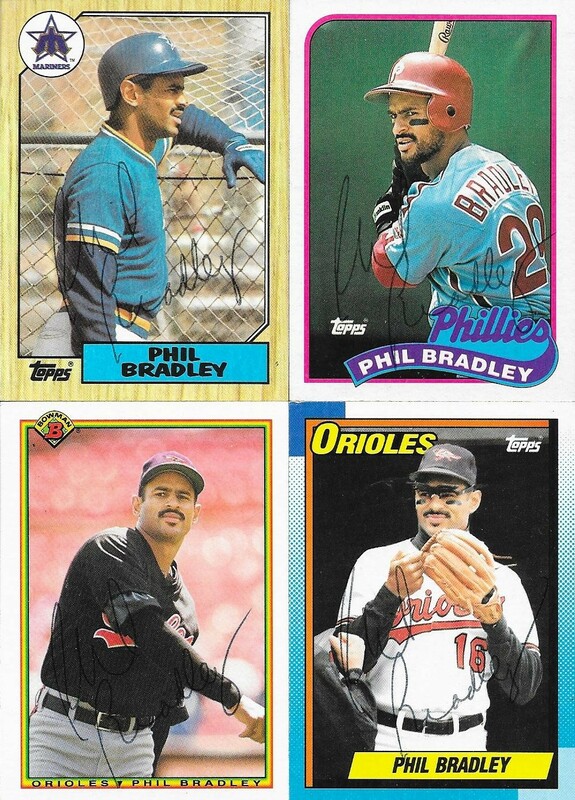 I also added some nice Topps cards, especially the 1986 Topps Traded Orioles card. They all turned out really well. Bordi (b. 1959) played in the majors from 1980 to 1988 for the A's, Mariners, Cubs, Yankees and Orioles. He had a career record of 20-20 with a 4.34 ERA and 247 strike outs. I mailed to Bordi on September 19 and got the cards back on October 5, for a 16-day TAT. In my quest to add more signed cards to my 1987 set, I spent a little money to add some bigger names. 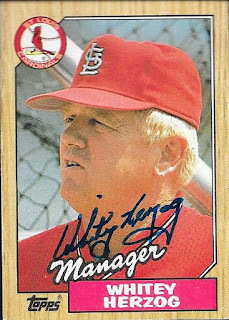 One of those was Hall of Fame manager, Whitey Herzog. He charged $5/card, which I gladly sent along. I went ahead and sent the above 1986 Topps so I could add another card to my album. Here is the 1987 that I sent, and it turned out really nice. Herzog (b. 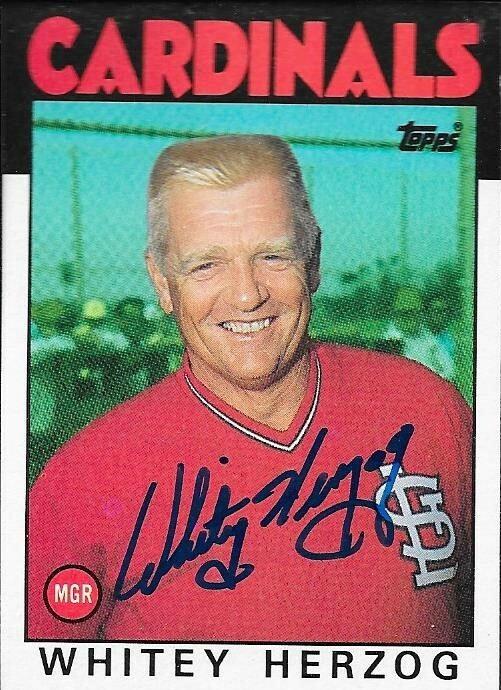 1931) played in the majors from 1956 to 1963 for the Senators, A's (Kansas City), Orioles and Tigers. He had 414 hits, 25 home runs and a .257 batting average. Herzog managed in the majors from 1973 to 1990 for the Rangers, Angels, Royals and Cardinals. He had a career record of 1,281 - 1,125 (.532%). He won the NL pennant three times with the Cardinals (1982, 1985 and 1987) and won the World Series in 1982. He was elected to the Hall of Fame in 2010 by the Veterans Committee. 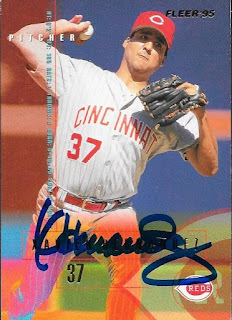 I mailed to Herzog on September 25 and got the cards back on October 2, for a 7-day TAT. 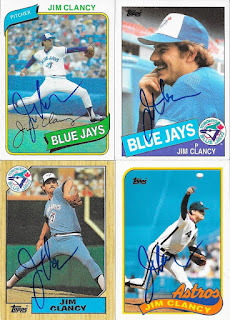 I have gotten some nice TTM returns lately from guys who played quite a while in MLB. 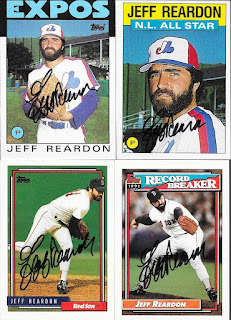 This success from Jeff Reardon was one of them. I had a ton of cards to choose from of him, and narrowed it down to 6 cards. This 1991 O Pee Chee turned out really nice, and I don't believe I have any in my autograph albums. I think this came out of a repack box that I got recently, so it may have been a late addition to my "to be TTMed" box. Of course I had to add a 1987 Topps to the binder. 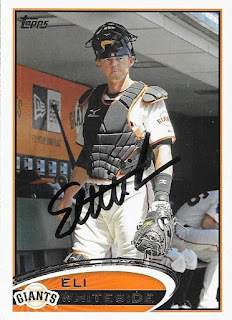 I'm pushing closer to 100 signed cards from that set, which is pretty nice. It means I was able to get at least 100 cards out of my bulk box! Here are the other cards that I got back. I chose to do base and additional of 1986 and 1992 Topps. Top row we have the 1986 base and 1986 All Star and bottom we have 1992 base and 1992 record breaker. Reardon (b. 1955) played in the majors from 1979 to 1994 for the Mets, Expos, Twins, Red Sox, Braves, Reds and Yankees. He had record of 73-77 with 877 strike outs and 3.16 ERA. 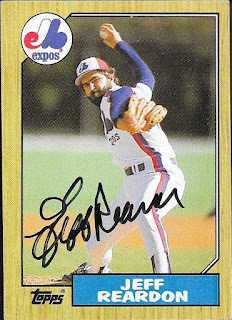 He had 367 saves in his career, leading the NL in 1985 with 41 while with the Expos. He was an All Star in 1985, 1986, 1988 and 1991. His best finish for the Cy Young Award was 5th (NL) in 1985 and for MVP was 11th (AL) in 1987. He finished 6th in the 1980 NL Rookie of the Year Award voting. Reardon won the World Series with the Twins in 1987. His 367 saves rank 10th all-time. 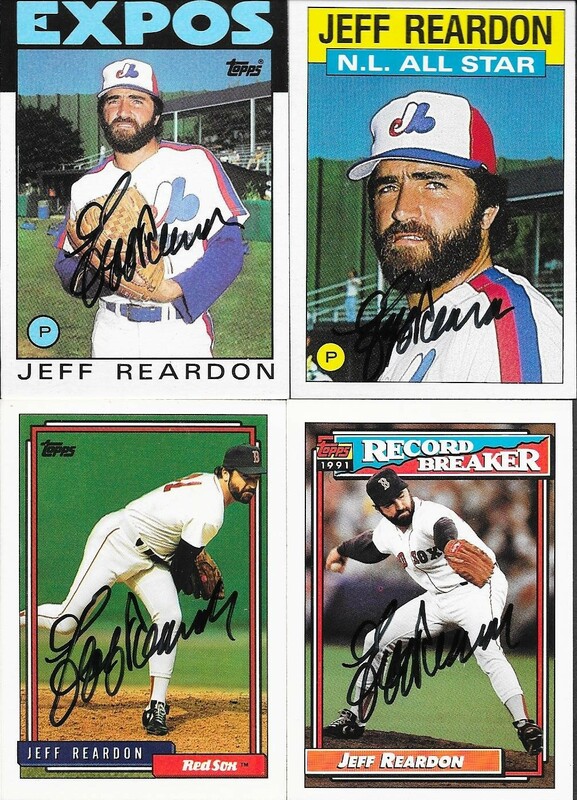 I mailed to Reardon on August 29 and got the cards back on September 29, for a 31-day TAT. Birthday Gift and Some Autos From Nick H.